60 roses or 5 dozen roses, send to people you love the most. 60 roses or 5 dozen roses, no special meaning for this amount. You could make it a significant meaning for a special person or people you love the most. With a bouquet or vase of 60 roses. 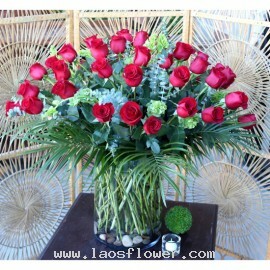 60 red roses or 5 dozen red roses arranged in a clear glass vase accents with eucalyptus leaves and other green leaves. We will add a beautiful bow on it to send as a gift. The color of roses can be changed such as white, yellow, orange, pink, purple and peach. Occasionally, substitutions may be .. 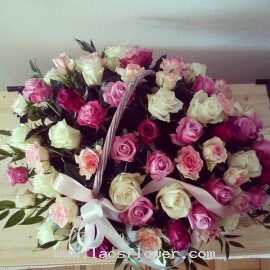 Basket of 60 roses consist of pink roses and white roses. Decorated with a pink bow tie on the handle. Perfect for congratulations. Send your mom on Mother's Day. 60th birthday gifts. Occasionally, substitutions may be necessary to create your bouquet due to the availability of certain flower..